Airlines are liable for any check-in luggage that is lost, whatever misplaced or stolen. Fortunately, most airline lost luggage is reunited with their owners within few days. It is estimated that between 0.5 - 1% of all check-in bags fail to meet up with their owners at the arrival airport. Of those, 80-90% is located within 24 hours and 95-98% within 5 days. This means only small proportion of "lost bags" is permanently lost but luggage is officially declared lost if it has not been returned to its rightful owner within 21 days. This is still a sizeable figure worldwide, estimated around 1 million bags in 2011. Airlines rules about making lost luggage claim vary but all the major airlines provide detailed instructions about their claiming process on their websites. The first step is to report your luggage lost at your arrival airport but most airports have special Lost Baggage desk. Often they can locate your bag in their IT system, e.g. it may be on the next flight arriving later in the day. Still insist they fill out a lost luggage report and get copy of the report (important if the bag does not show up after all). Also, get the name of the person that filled out the form and a phone number for following up on airline lost luggage. You will have to describe your bag and usually the content too. Most of us struggle remembering the details so it can be very useful to have a photo of your bag (easy on digital age). Your airline should cover the essential cost resulting from the luggage delay. Some airlines offer immediate one-off set amount to cover necessities like toiletries and underwear. Others only reimburse essential items against receipts. Find out in advance, for what and how much the airlines reimburse and make sure you keep all receipts. You should then be able to leave the airport and the bag should be delivered to you free of charge when (if) found. The process can vary between airlines but usually unclaimed luggage is kept at the airport for few days. 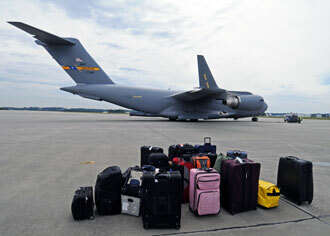 Vast majority of the luggage is returned to their rightful owners during this time, usually within the first 24 hours. All the major airlines use the World Tracer System (airline information management system) to help matching lost luggage with its rightful owners, i.e. by matching tag numbers, luggage type, color, and brand with the airline lost luggage reports. It the luggage is not reunited with its owner within this period it is moved to central warehouse where it is kept for defined period (usually between 60–100 days). The airlines make all effort to locate the luggage owners during this time but if not successful then Unclaimed Luggage is disposed of. If your bag has not been located within 21 days, it is officially declared as permanently lost luggage. You will then have to submit new more detailed airline lost luggage report, including about the estimated value of your lost belongings (bag and its content). The Montreal Convention of 1999 introduced a uniform legal framework to govern air carrier liability in the event of damage caused to passengers, baggage or goods during international journeys. 103 of the 191 ICAO Member States have (as of August 1st 2012) ratified the Montreal Convention of 1999 including the United States, all members of the European Union (EU), Australia, Canada, China, India, Japan, Korea and Mexico (Wikipedia ). According to the Montreal Convention the airlines liability is limited to certain amount, currently 1,000 SDR (February 2013). If your belongings are worth more you can declare higher value when you check your bag in but there is usually additional charge for it. The airline can though refuse to sell you extra protection or cap it (only up to maximum amount). Taking out adequate travel content insurance is the safest option if you are travelling with valuable and / or fragile belongings. Airline may try to get you to claim your personal belongings from your travel insurance provider but they cannot insist on that. Travel content insurance may however be necessary for you to be able to claim the full amount for replacing your lost belongings. Airlines are legally liable for lost airline luggage but the liability is based on the depreciation value, not the replacement value, of your bag and its content. There can be a big difference between those two valuations. Furthermore, airlines are not liable for many high-value items when checked-in, e.g. jewelry, artwork, electronics, fragile items, valuable papers, cash, etc. You should always keep "unacceptable baggage items" items like this in your hand luggage. Some airlines attach Limited Release Tag (LRT) to certain types of luggage, e.g. sporting equipments, prams and buggies, musical instruments, etc. The airline might refuse your lost luggage claim based on the LRT conditions. They however cannot do that according the Montreal Convention, i.e. if they accept an item for check-in then they have accepted their liability. Luggage tracking services, like Global Bag Tag, i-TRAK, Trace Me Luggage Tracker or TAG&TRACK, can be reduce the risk of permanently losing your luggage. Most airlines have clear process how to make airline lost luggage claim but this is an example of a Letter Of Complaint if needed.